I had Wylie in September 2016 and he had a passport appointment within a few days of being born. My husband and I didn’t want to do an international trip too early, so we cured our wanderlust with a few West Coast road trips during the fall of 2016 and we planned a trip to South America for after Christmas. Wylie would be just under four months old, a sweet spot we’d heard for traveling with a baby. The holidays were a whirlwind and I had a cold by the time our trip rolled around. On the flight to Buenos Aires, Wylie slept soundly for seven hours in a bassinet fixed to the wall (something that can be arranged if you have bulkhead seating). I was a mess, blowing my nose and coughing, and getting very little sleep. Wylie was quite refreshed when we arrived in Buenos Aires. Justin and I were exhausted by the time we arrived in BA. After passing through customs, we quickly paid for a taxi and then went off to our Airbnb. We were dropped off at the address Justin had been given, but something was off. We were at the pin, but the building number we were looking for nowhere to be found. Justin ran around searching for the address while Wylie and I sat in the shade (it was a sweltering 80 degrees with humidity). He couldn’t find it. He went to a cafe with internet and figured out we were in the wrong location. Our apartment was half a mile away. We finally made it and after a shower we fell asleep hard for four hours. Wylie napped right along with us. 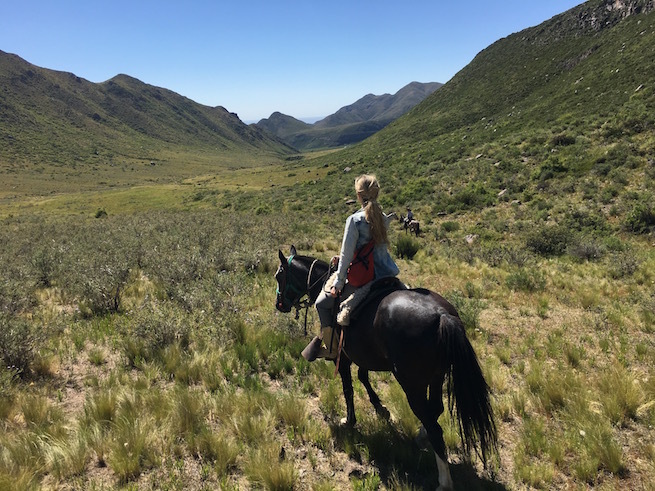 I went horseback riding in the valley known as Pampa del Durazno in the Uco Valley. Those first 48 hours were by far the most challenging of the trip, but none of the drama had to do with Wylie. It really was just the regular hiccups that come with international travel. Things smoothed out from there and we enjoyed dinners out, activities like horseback riding and wine tasting and relaxing at the beach. I came away from the trip feeling like Justin and I were able to do all the things we would have done had it just been the two of us. Travel with baby requires effort, but travel, good travel, always requires some work. I feel very resolute in saying you can travel with baby. Here are some tips I picked up along the way. I think the hardest thing about traveling with a baby is packing. Some of the packing lists out there will make you want to shelve the trip all together. Of course you need to be prepared, but I think an important part of traveling with a baby is realizing that it’s not possible to be prepared at every moment for every scenario. This adventure will require some improvising. Certain things are necessities– stroller, diapers, diaper cream, clothing, swaddles, burp cloths, and baby wipes, but unless you are going to a remote place, it is possible to purchase things you need at the destination. Pharmacies across the globe carry diapers, bug spray, baby tylenol etc… So, if you forget something, or run out of diapers, it’s not the end of the world. 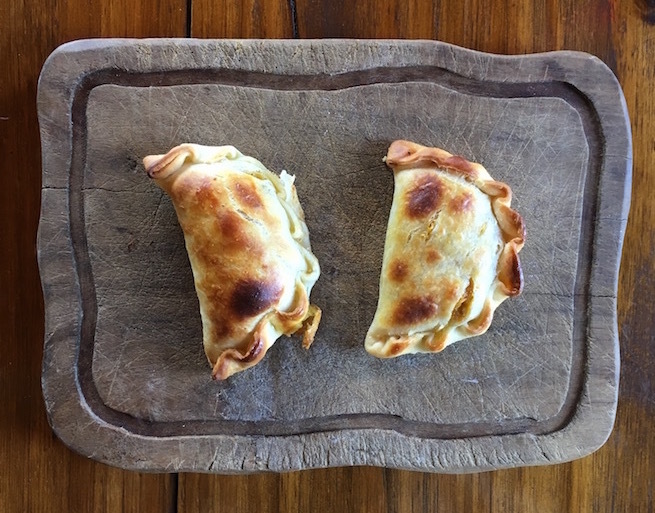 Fresh out of the oven empanadas at Estancia La Alejandra. I love horseback riding and it’s a fun activity in South America. Before we went down, Justin told me he’d be willing to watch Wylie while I did some riding in Mendoza. I chose a ranch called Estancia La Alejandra. Justin and Wylie hung out in a charming 100-year-old guest house while I rode and then we all had lunch together. In Uruguay, there was another horseback riding opportunity and so I urged Justin to go. 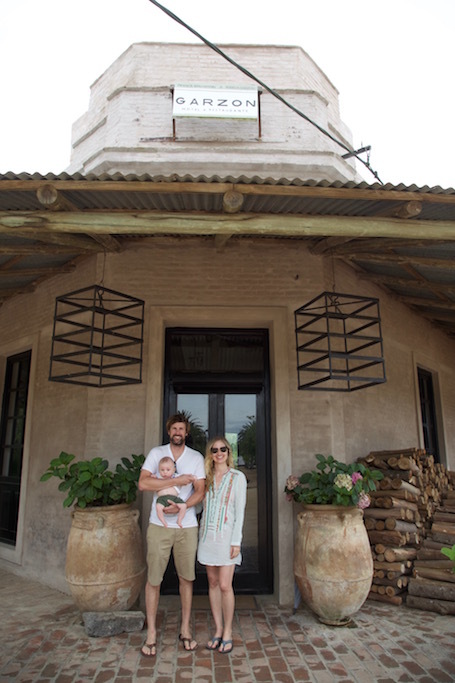 We were staying in Garzón, a former staging post in the Uruguayan countryside at famed Argentine Chef Francis Mallmann’s Hotel & Restaurant Garzón. 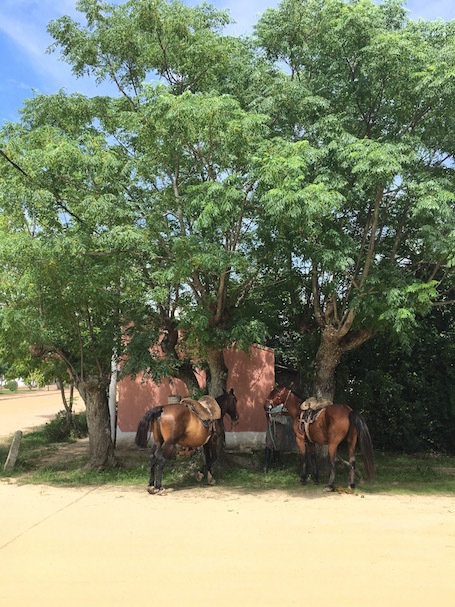 The horses came right to the hotel’s doorstep. Justin saddled up like a gaucho and took off across the town square with a guide. Wylie and I hung out at the pool where we met Mallmann himself. He happened to be in town visiting the property for two weeks. Both Justin and I had a wonderful time. While it’s fun to do things together, if you’re willing to divide and conquer, you may end up having an even more memorable vacation. 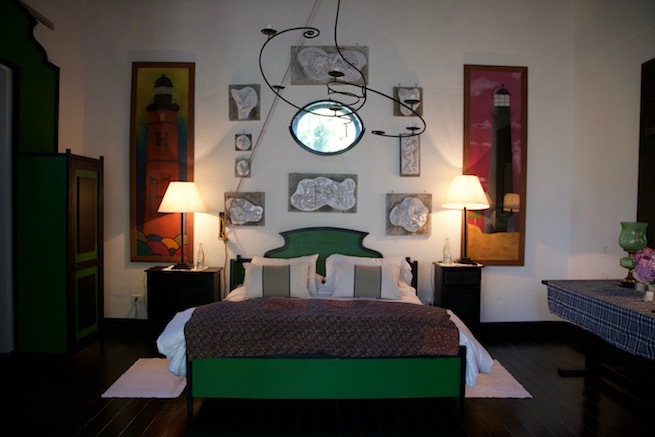 Our guest room at Hotel y Restaurant Garzón accommodated the three of us easily. My two sisters had babies before I did and I saw that as children become more mobile, travel does become a more difficult. I believe an traveling with a baby is ideal when they’re between one and eight months. Your baby probably sleeps a ton, is light as a feather, can fit in the baby bassinet on the airplane, and may not yet be grabbing for everything on your tray table. This also makes this the ideal time to maximize eating out. Wylie typically slept through our dinners in South America. 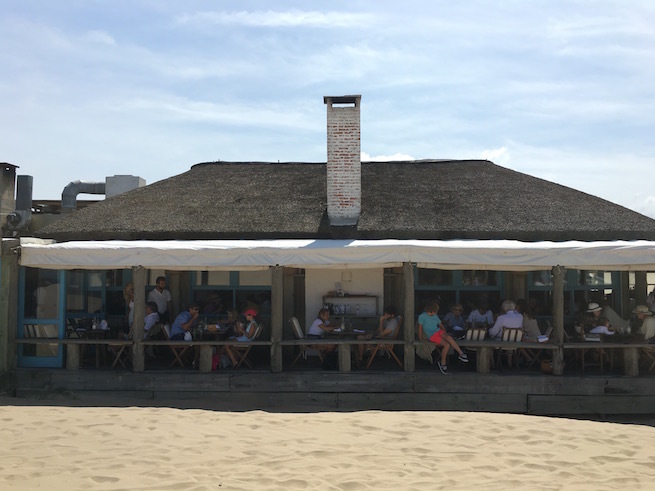 This allowed us to savor some incredible meals on what we called our “Francis Mallmann crawl” at Garzón, Parador La Huella in Jose Ignacio and Siete Fuegos at the Vines Resort and Spa. Wylie’s first time in the ocean. For many years, Justin and I prided ourselves on our ability to use public transportation to get to and from the airport and around cities all over the world. When you have a stroller, a car seat and luggage for three, this is a lot less appealing. I’m not ashamed to admit that I will probably opt for a car hire or taxi to and from airports when traveling as a family and I’ll use Uber for getting around cities like Paris when it’s not possible to walk to our destination. It’s an added expense, but ride sharing makes it doable and not having to navigate broken ticketing machines and miles of stairs with a baby and a stroller will help keep me sane. We had several amazing dinners at Parador La Huella in Jose Ignacio. 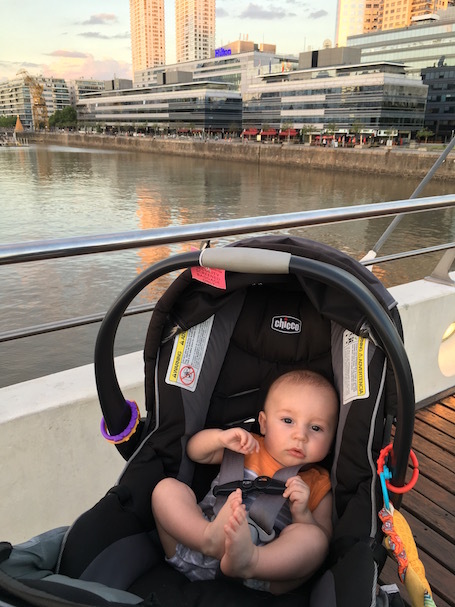 South America might seem like a pretty exotic place to go on your first big vacation with a baby, but we have good friends in Buenos Aires and Mendoza. Justin and I had been twice before so it wasn’t completely foreign to us. On your first international trip with a baby, I recommend choosing something that isn’t too far outside your comfort zone and that allows you to do activities that are conducive to family travel. On this trip, we did less museum visits and tasting menu restaurants and more asados with friends, wine tastings, visits to swimming pools and beach playtimes. Have you traveled with baby? Where did you go? Would you recommend it? Let me know in the comments below. I have a question. How were you able to use taxis/Uber with a car seat? I’m going to Uruguay when my baby turns 4 months and I’m trying to figure this out. I don’t know what to do if we bring a car seat. Do we bring it to us once we get to our destination? Or should we just rent a car and install our car seat in it for the rest of the trip and leave it in the car? Thank you for your question. You absolutely can take your car seat in Ubers and taxis in Uruguay and Argentina. When we went to South America, my son was three months old and we were still using the car seat insert (we had a Chico Keyfit) in our stroller. 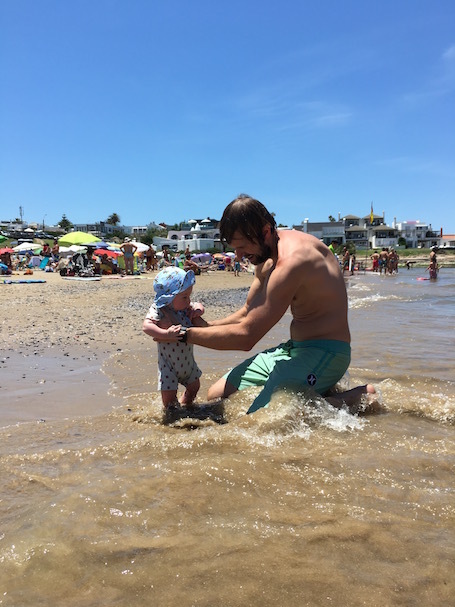 We knew we were going to be doing a mix of taxis and car rentals (such as a taxi from the airport in BA to our apartment in the city, but a car rental from the airport in Punta del Este) and so it just made sense for us to bring the car seat. You can always rent a car seat when you do a car rental, but sometimes these seats are not great quality and then if you do need to take a taxi before you do your rental, you won’t have one. The car seat and the stroller should be free to check. We also opted not to bring our car seat base when traveling because it was so heavy and we felt that the car seat was safe without it. You’d have to check to see if this works with your particular seat. Regardless, I think you should bring your car seat and then you will be able to use it in taxis or a car rental or a mix of both. Did you have to vaccinate your 3 month old baby before travelling to South America and what were the requirements? I’ve heard yellow fever is mandatory but babies can only have them after 6-9 months old. Hi there. Thanks for your question. This all depends on which country/countries you are planning to visit. We went to Argentina and Uruguay where yellow fever vaccinations were not required or recommended. Here is the latest map showing where vaccinations in South America are recommended from the World Health Organization https://www.paho.org/hq/images/stories/AD/HSD/IR/Viral_Diseases/YellowFever/YF_Vaccination_30July2018.jpg?ua=1&ua=1 and here is the latest list of vaccination requirements and recommendations by country for international travelers http://www.who.int/ith/ith-country-list.pdf. In general, it seems like when a yellow fever vaccination is required it is for travelers who are a year or older, because I don’t think it’s recommended for babies, but you should absolutely consult your doctor about this. Before we went on our trip, the vaccinations Wylie had received included Hepatitis B, Rotavirus, Diphtheria Tetanus Pertussis, Haemophilus Influenzae Type B, Pneumococcal Conjugate and Inactivated Polio. Hope that helps! I am heading to SA in a couple of months My baby will be 9 months and I was wondering if ALL airlines check car seats and strollers for free, and if they let you do gate checking. I have looked information on the airlines website and they only mention strollers but not car seat. Hi Adriana. Thank you for your question. All major airlines should allow you to check a carseat and a stroller for free at the check in counter or at the gate. Can you let me know who you are flying and I will double check for you?